New 15″ Bebe Fleur “Frenchette” For Sale! 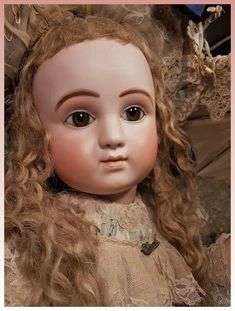 This beautiful, museum quality 15” Bebe Fleur “Frenchette” antique reproduction porcelain doll was lovingly created by “Millie” winning, world renowned artist, Connie Zink of Land of Oz Dolls. The artistry is superb with wonderfully detailed French eyebrows, beautifully spaced eyelashes, perfectly shaped lips with accents, and a hint of lavender eye shadow. Her porcelain head is on a FB12JS composition body from New York Doll Products. She has beautiful brown paperweight eyes with lots of depth. She has a dark brown human hair curled wig with bangs. This doll is being listed both as a dressed doll and as an undressed doll at this time. 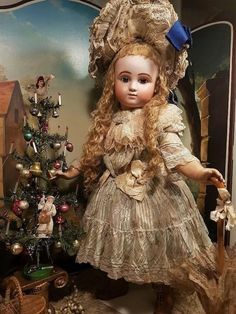 She is shown in a beautiful French-style flowered silk dress and hand made straw bonnet that was also created by Connie Zink from a costume kit specifically created for this doll by Lorna Yates. She also has cotton slip and underwear, along with black leather shoes made by Pam Willits and silk crocheted stockings. She is being listed as an undressed doll for $395.00 with wooden base doll stand. If you are looking to add an exquisite Bebe Fleur to your collection of antique reproduction dolls, this may be the one for you. Dressed as shown this doll is $550.00. Shipping and insurance to continental U.S is $25.00 by United Parcel Service. International shipping fees will be calculated upon request. My shopping cart buttons do not figure international shipping costs so please contact me at landofozdolls@mchsi.com for a shipping quote. Good afternoon, I am pleased to share with you my newest doll that has just been listed on my “Dolls For Sale” page. This doll is available as both an undressed doll on a composition body or purchased as head only with glass paperweight eyes and mohair wig. This beautiful, museum quality 20” Mlle. Florence F.G. (F. Gaultier) undressed antique reproduction lady doll was lovingly created, in the U.S.A. by “Millie” winning, world renowned artist, Connie Zink of Land of Oz Dolls. Connie has had 38 years experience in making authentic antique reproduction and modern dolls. Connie’s studio is located in the rolling hills of beautiful, northwest Illinois, along the Mississippi River. This doll is made from the Seeley mold S-134 Mlle. Florence. The artistry is superb with wonderfully detailed French eyebrows, beautifully spaced eyelashes, perfectly shaped lips with accents, and a hint of eye shadow. Her complexion is flawless. Her porcelain head is on a FLB16S composition lady body from New York Doll Products. The body resembles an old leather body but is made from a latex composition that will last for years. This is the last of these bodies I have available so last one that can be sold on the FLB16S composition body. She has beautiful brown paperweight eyes. She is wearing an exquisite old store stock of a Global light brown mohair Baby Lauren wig. I have been saving this beautiful wig for just the right doll and I believe this Mlle. Florence is the perfect doll for wig. This Doll Has Been Sold!! 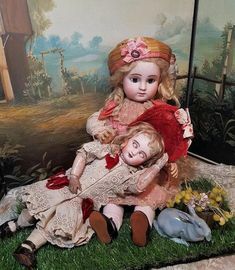 This beautiful, museum quality 15” Jumeau “Frenchette” antique reproduction porcelain doll was lovingly created by “Millie” winning, world renowned artist, Connie Zink of Land of Oz Dolls. The artistry is superb with wonderfully detailed French eyebrows, beautifully spaced eyelashes, perfectly shaped lips with accents, and a hint of lavender eye shadow. Her porcelain head is on a FB12S composition body from New York Doll Products. She has beautiful blue-grey paperweight eyes with lots of depth. She has a dark brown human hair curled wig with bangs. This doll is being listed both as a dressed doll and as an undressed doll at this time. She is shown in a beautiful French-style red silk dress with lace trim and bonnet that was created by Pam Willits. She also has cotton slip and underwear, along with red leather shoes made by Pam Willits and hand crocheted stockings. She is being listed as an undressed doll for $395.00 with wooden base doll stand. If you are looking to add an exquisite Jumeau to your collection of antique reproduction dolls, this may be the one for you. Dressed as shown this doll is $495.00. Shipping and insurance to continental U.S is $25.00 by United Parcel Service. International shipping fees will be calculated upon request. My shopping cart buttons do not figure international shipping costs so please contact me at landofozdolls@mchsi.com for a shipping quote. 15″ Bru 13 “Frenchette” Available For Purchase! I have just added this beautiful 15″ Bru 13 “Frenchette” series doll to my Dolls For Sale page. Quantity is limited to one. 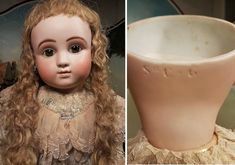 This beautiful, museum quality 15” Bru 13 “Frenchette” antique reproduction porcelain doll was lovingly created by “Millie” winning, world renowned artist, Connie Zink of Land of Oz Dolls. “Frenchettes” were created in 2009 by Connie as a series of antique reproduction dolls all using the same size body so the many costumes available are interchangeable. The artistry is superb with wonderfully detailed French eyebrows, beautifully spaced eyelashes, perfectly shaped lips with accents, and a hint of lavender eye shadow. Her porcelain head is on a B-413 composition body handmade by Connie and Dennis Zink. She has beautiful blue paperweight eyes from some old store stock that had been put away for years. She has a light blonde mohair curled wig with bangs. This doll is being listed as a dressed doll and an undressed doll at this time. If buying the dressed doll she comes in the costume as shown. It is a beautiful slate blue silk dress with antique lace trim and a bonnet that was created by Pam Willits. She also has a white cotton slip and underwear, along with tan suede leather shoes handmade by Pam and crocheted silk stockings. She is available as an undressed doll for $375.00 with wooden base doll stand. 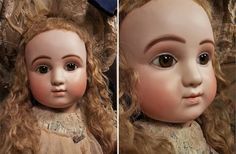 If you are looking to add an exquisite “Bru 13” to your collection of antique reproduction dolls, this may be the one for you. Dressed as shown this doll is $495.00. Shipping and insurance to continental U.S is $20.00 by United Parcel Service. International shipping fees will be calculated upon request my shopping cart buttons do not reflect international shipping prices. If you are an international buyer you may purchase and additional shipping charges can be billed to you through Paypal. New Premiere Bleuette For Sale! Sorry This Doll Has Been Sold! New Premiere Jumeau by Connie Zink Is Available! Good evening to all! I was already to announce that I had two Premiere Jumeau Bleuette’s available for purchase but one sold before I got it up here on the website. In the photo below the brown eyed one is no longer available. They really did make a cute pair. The one on the right with the brown eyes is made from the Seeley mold and the one on the left with the blue-grey eyes is made from the Collectible Doll Co. mold. The matching costumes were created by Sue Sharp of The Sharp Needle. Since the brown eyed one is no longer available I have listed only the blue-grey eyed one on the Dolls For Sale page here on my website. Here is a link to a more complete description and a shopping cart button. Bleuette Jumeau is available as both a dressed doll and an undressed doll. These are the first Bleuette Jumeau’s I have had done in almost 18 months. I have a few more other Bleuette’s and Bleuette “Friends” that I have started and hope to have available soon. I hope everyone has been having a great summer and I look forward to getting out of the garden and back into some doll-making! Thanks to all of my supportive customers and hope to talk to you again real soon! Also please remember to sign up for the drawing for the “2016 Holiday Bleuette Giveaway”! Here is a link for the drawing: https://landofozdolls.net/ The random drawing through Contest Hopper will be held on December 25th, 2016! The New “Frenchettes” Have Been Listed For Sale! My three “Frenchettes” have been finally listed for sale. Photos and complete descriptions are on my Dolls For Sale page.